It was the best of times . . . and the worst of times. But 2009 was the "year of fine" as Bright Blue coined earlier in the year. Mom and Shuga D just returned from an Eve's Eve celebration in Atlanta where they got down with the Band of Horses at the Tabernacle, reveled their view from the top and noshed on some nostalgic maki rolls at RuSan's in Midtown. But that's not the only thing Mom reminisced over. It was driving by 83 Walton Street, former home to Capricorn Records, where Mom worked the mail room and receptionists' desk during her college days. Just as their car crossed Cone and Walton, Cake's "Going the Distance" came on the radio, one of the hit singles the label had at the time. Sentimental-lately Mom couldn't help but choke up over what a distance they have all come . . . and how the journey had ended for some. Vic Chesnutt was also on the Capricorn at the time of Cake. He was no stranger to the phone lines at the label, and his friendly, quirky voice was always fun to receive. And it was Vic's "Salesman and Bernadette" poster that proudly gave her the most paper cuts in the mail room. It was heartbreaking to learn of his passing over the holidays, and there is no doubt Georgia music lost one of its best players. Mom hopes her late Uncle Phil was among those to greet Vic Chesnutt when he found his peace and thank him for the amazing music he contributed to the Capricorn family. Sad songs aside, they haven't even been home an entire hour, but Mom and Shuga D are dressed up with some places to go. 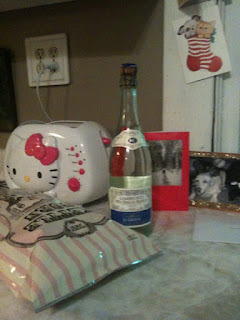 She and Shuga made a pit stop at Trader Joe's for some champagne and pink-bagged kettle corn. Now she is wearing her new pink baubles purchased from H&M just a little while ago and her sequin blouse that was among her Christmas clothing scores from her father. So why all this pink? They are looking forward to the Cherry Blossom ball drop in downtown Macon, as well as another one of the amazing players who made 83 Walton Street extra special. Col. Bruce Hampton is performing at the Hummingbird this evening, and if there was ever a "father time," well . . . you got him. Cheers to the passing of a decade, and the beginning of a new one. Cheers to the adventures that will always be ahead. And remember, Candy Lou loves you!! She's a media maven by trade, co-owner of a music history tour company on the side, host of radio show "Love Child of Rock" for fun, wife to a candy man by fate, Macon city-dweller since birth and mama to a toddler all the time. Join Jessica Walden for musings and battle anthems of motherhood as she dives deep into the thoughts and threads of family life, feminism and the colorful fabric of her community. He was born into a legacy of bon-bons, macaroons and the sweet life of candy manufacturing. She was raised in the shadows of rhythm and blues and after-shocks of southern rock. Together, they grew up in the town of Macon, Georgia that they never knew how much they loved until they fell in love with each other. In 2011, Jessica Walden and Jamie Weatherford founded Rock Candy Tours, a music history tour company that showcases the legacy of Macon, Georgia’s rich music history. Once home to artists like Little Richard, Otis Redding, James Brown and the Allman Brothers Band, Macon was listed among legendary studio engineer Tom Dowd’s “Five M’s” of music towns, joined by Manhattan, Miami, Memphis and Muscle Shoals. They believe Macon’s storied music history doesn't have to live in a museum, but already existed on its sidewalks, street corners, historic structures and if the walls could talk, they would sing. Visit Macon Candy's Sister Site at rockcandytours.com. Merry Christmas from the Candy's Land Crew! Happy Birthday to the One and Only Shuga D! Since We're Putting out the Manger Scene . . .